No longer are drawings considered mere preparatory drafts for a future artwork—they’ve come to be their own envisioned entities and usually bear quite interesting art theories. As an art lover and a poet, I practice ekphrasis. Simply, ekphrasis poetry are poems inspired by another art form—in my case, the visual arts. So I've written a number of poems about admired if not beloved paintings, sculptures, drawings, installations and other types of visual art. However, I've written more based on the visual arts process—or my perception of the process—rather than a specific art work. For example, an entire book—my first U.S.-published collection, Reproductions of the Empty Flagpole (Marsh Hawk Press, 1998)—was inspired by, as well as explored my imagined offshoots of, abstract expressionism. 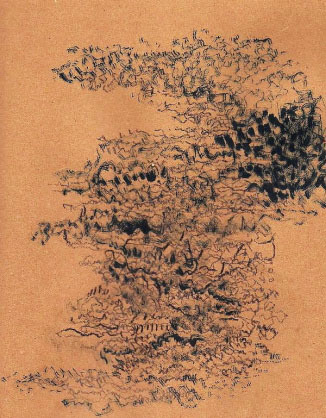 Most of the poems in that book do not refer to a specific abstract expressionist work but, instead, engage the approaches of abstraction and expressionism. An approach, however, is not necessarily visual—a painting is visual, but not necessarily the process that created it. My focus was on the process of making, which encompasses the underlying philosophies to what generates a particular artwork. My thrill over the process itself—regardless at times of the outcome—is one reason why I am also inspired by conceptual art. Actually, beyond those works that others would categorize as "conceptual art," I am generally interested in any art work's conceptual underpinning. In relatively recent times, some of the most interesting art-making philosophies and strategies have surfaced from the world of drawing. No longer are drawings considered mere preparatory drafts for a future artwork—they’ve come to be their own envisioned entities and usually bear quite interesting art theories. 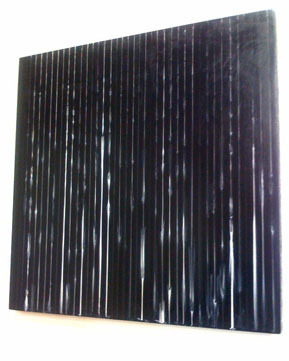 The cover to my first book, BLACK LIGHTNING (Asian American Writers Workshop/Temple University Press, 1998) reflects a canvas “by” Theresa Chong who basically allowed gravity to draw the resulting image; that is, a wet black canvas was tilted vertically so that the dollops of white paint on top of the canvas then fell down linearly but also fragmentally down the black backdrop depending on how the black and white paint gravitated (pun intended) to each other. By being “by” gravity as much as Theresa, the work partly reveals a concern over the instability of identity (in turn, a not irrelevant concern to artists of color). Other contemporary masters of drawing—Maureen McQuillan, Eve Aschheim, Andrew Bicks, James Westwater, among others—enliven my life with not just their artworks but (my perception of) their philosophies and concepts that birthed them. With my interest, thus, in the art-making process and not just the artwork, I immediately adored the haptic drawings created by Filipina-American poet-artist-critic-editor Jean Vengua. 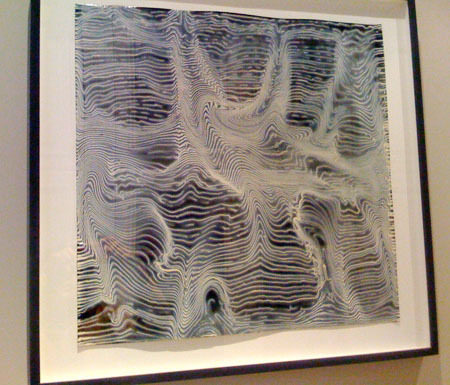 Introduced to haptic drawings by the works of San Francisco-based poet/visual artist Stephen Vincent, I would come to be fascinated by Jean’s own creations. It is also through Jean that I’ve come to take a closer look at the conceptual underpinnings to haptic drawings. 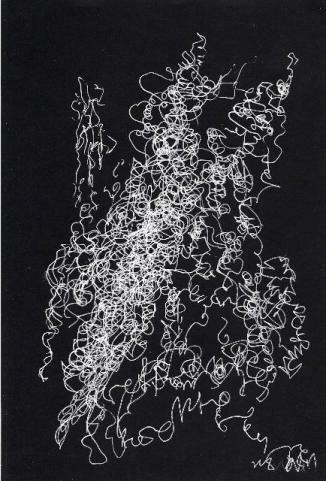 Jean creates her haptic drawings as she is engaged with something else—often music and other types of sounds, e.g. when someone reads poetry out loud to her or nature sounds emanating from animal and bird activities in her yard. While she often draws to sound, she can also draw to non audio events, e.g. a David Bowie video and a theater performance. 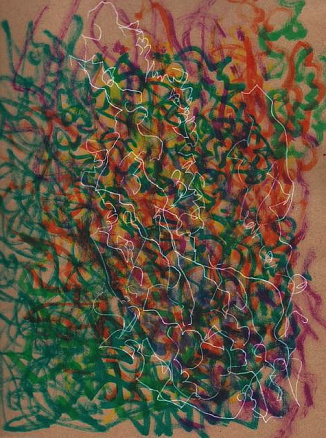 Haptic drawing, as I use the term, is a meditative and contemplative practice, in which awareness of the body and empathic awareness of the object of the drawing are integral. The “haptic” process uses the “whole” experience—interior and exterior—as a “touchstone” to the drawing experience. “Haptic” is often related to “touch” therapy, where healing and creativity occurs through empathic touch. While we may not necessarily touch the object we are drawing, we can sensitize ourselves (through the various senses) to the object. 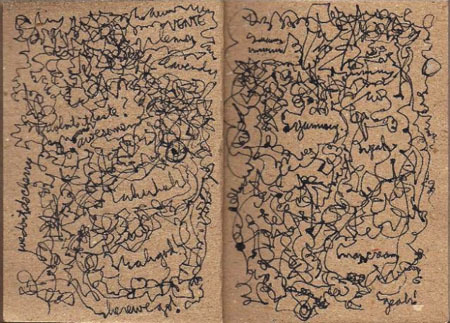 In awareness of the drawn object and our own subjective experience (thoughts, emotions, body feelings), the body translates it all through our hands and onto lines on paper. "pertaining to the sense of touch," 1890, from Greek haptikos "able to come into contact with," from haptein "to fasten." Online Etymology Dictionary. Aristotle, in De Anima (c.350BC) established a hierarchy of the senses which positioned sight as the superior sense and touch as the most ‘bestial’ and thus at the bottom. Such a hierarchy effectively sets up a system of and for perceiving whereby that which is seen supersedes that which is felt or touched in terms of truth–knowing. In his statement ‘I think, therefore I am’ René Descartes (1637, part IV) separates mind from body and prioritises the mind within that relationship. By extension, then, the abstract becomes prioritised over matter and sight over touch, an occularcentric mode of thought and language that stems from European post–Enlightenment discourses and one that has been traditionally perpetuated by philosophers and theorists of visual culture. to increase awareness of the body, its creative, aesthetic, nervous and energetic dimensions and impulses, and the relationship of yourself to inner and outer worlds. As the drawings emerge, so may recurring lineal gestures and symbols--threads from which to record knowing, or to draw meaning, personal and communal, the stuff of storytelling and myth. Jean’s philosophy—and despite the attractive results of her approach as exemplified in the above reproductions—made me think of the phrase “post-visual.” I thought of that phrase because Jean’s goal is not the drawing itself. The more important impetus here would seem to be “the relationship of yourself to inner and outer worlds.” Drawings—just like poetry, story-telling and other activities—then becomes just a way to better understand one’s history, culture and environment. And not understand it in a purely abstract way, given the very personal involvement of one’s body. 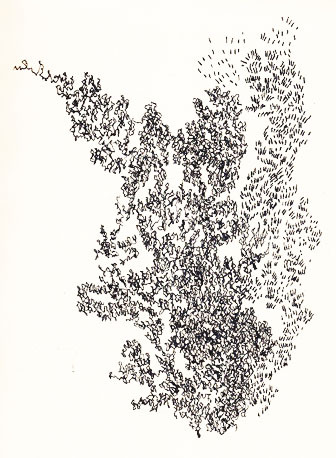 Drawing becomes a path for expanding the expanse of one’s empathy. Isn’t such an impetus, therefore, creating a means for one to form healthier relationships with others, nature and other aspects of one’s environment, and even intellectual or academic pursuits? Isn’t the goal then to be a better person as well as a better citizen of the world? And wouldn’t such a result be one of the best validations of the importance of art? The “Banter” haptic is interesting for incorporating overheard words. It’s a direct way to illustrate paying attention to the world. It’s a way to show that the artist is not just making a drawing but listening to others. Isn’t that what we all would like many times—to be heard? But Jean didn’t just hear actively; she didn’t just listen. Jean acted: she created a drawing that would proclaim, I see you. The lines across the paper evoke writing. I am a writer. But what I treasure about the above drawing is how the line shows it continuing beyond the paper-as-page, that the limits of the page does not limit the writing. The line could have stayed within the contours of the larger image but instead it separates to continue moving past the image. It’s just like my beloved abstract expressionist approach—how, in some of the greatest abstract expressionist paintings, the brushstrokes seem so energized they seem to continue beyond the edges of the canvas. With haptic drawings, Jean has trained her eyes to see better as a result of her bodily involvements. 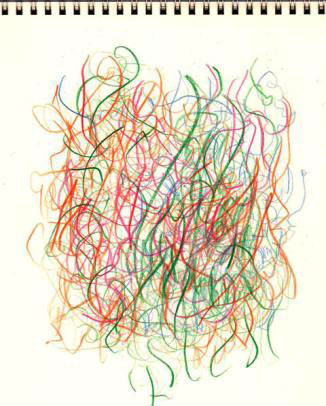 I doubt that she was specifically thinking of my love for abstract expressionism when she made this drawing—but I am not surprised at how this drawing reveals a munificent empathy for who I am. The goal, of course, is not the drawing—and so, as a result of her empathy, she’s become a good friend. To make her drawing, Maureen begins with a wet black or dark background. She then meticulously lays white lines in close parallel formation across the dark. She then picks up the work and places one edge against her torso and belly. She then moves her body (perhaps like a slow belly dance) and the work about, making the still-wet lines swirl into a variety of shapes. It’s a sophisticated approach that involves her body but not her ego (the latter being through a conscious intent of what to draw). From such an intimate act surfaces imagery that, in a beautifully-ironic twist, can evoke the larger universe—the image above, for instance, could be a landscape (on Earth or elsewhere) or a topographical map. So Maureen uses not just her hands but her entire body to make her drawing, but the result is imagery that nonetheless gestures outward to the larger world. I live in the U.S., in California, to be exact. And Americans and other “1st worlders” have been emerging (I hope) from an intensely “me” oriented period, using up earth’s resources and amassing material goods and money with no thought or consideration for the countries and peoples who labor in our factories and mines, and little consideration for other living creatures, except as food for our tables and pets that can be bred to match our aesthetic tastes. We have treated the creative process as if it were an object that can be purchased, like a can of foie gras or a spa treatment guaranteed to make us desirable. If you don’t know Jean, let me share that she also is a political and cultural activist. That’s just a logical effect of, as well as inspiration to, her art which is not about the marks on paper so much as the ensuing relationships of one’s “self to inner and outer worlds.” Post-visual: what is significant is what is not visible.